Can chaotic systems also synchronize with each other? How do synchronization and self-organization emerge from systems that didn't have these properties to begin with? Characterizing and understanding the transition from disorder to synchrony is of fundamental importance to understanding the emergence of synchronization and self-organization in nature. 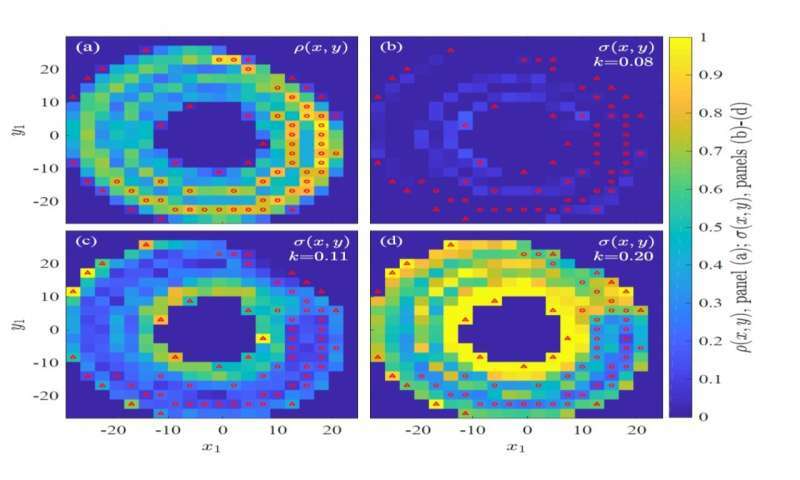 "Chaotic systems, although unpredictable, still have a subtle global organization called strange attractor," says Nir Lahav, of Bar-Ilan University's Department of Physics, the study's lead author. "Every chaotic system attracts its own unique strange attractor. By Topological Synchronization we mean that two strange attractors have the same organization and structures. At the beginning of the synchronization process, small areas on one strange attractor have the same structure of the other attractor, meaning that they are already synced to the other attractor. At the end of the process, all the areas of one strange attractor will have the structure of the other and complete Topological Synchronization has been reached." "In order to understand why this is surprising, think of this scenario: two groups of friends meet at a party. In every group we can find extroverts, who easily connect with strangers, and introverts, who find it harder to connect with a new group," explains Lahav. "We would assume that the first connections would occur between the extroverts and only later would the introverts create connections. It would be very surprising to see this happen the other way around. But this is exactly what we found in our results. We assumed that the dense areas of the system, where most of the activity is, would sync with each other first (like the extroverts), but in reality we discovered that the low-density areas were the first to sync (the introverts)." Multi system integration/synchronization is crucial to understanding all other existing processes. Multiple eigenstates, if allowed to interact, can resolve to a single eigenstate as they initially compete, then cooperate for available resources. Well done, indeed! This could also explain transitions in social systems, as those outside the system work to effect change in the system from smaller scales up to higher ones. Those inside the system cannot do it immediately because they are snared by the perspectives and incentives of the system to maintain the existing social system. Only people outside the system can bring about the initial changes, because they aren't biased by the status quo. Transitions then must be done carefully, over enough time for people to adopt, adapt, and learn to trust them, and lead to some real tangible benefits for people, if not end up being supported by the majority of people through a mixture of imposition and consent. Think of the transitions in Europe from paganism to Christianity as an example, or from feudalism to capitalism to what will likely be a kind of socialism as we enter the Anthropocene, and become forced to effectively challenge inequality and environmental degradation.